Italian Air Force and Bulgarian Air Force are training together to increase their ability to defend NATO airspace. The italian "Task Force Air 4° Stormo" deployed in Bulgaria for enhanced Air Policing mission called "Bulgarian Horse" and the Bulgarian Air Force have jointly trained to keep their air assets updated on training and interoperability. 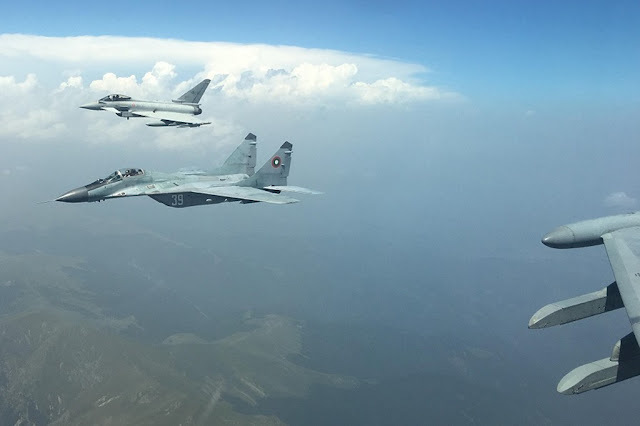 The Eurofighters of the Italian Air Force operated flight missions along with Bulgarian Mig-29 fighter jets in order to standardize the procedures of the two NATO countries and improve the flexibility of the flying crews. The italian fighter jets from 4th Wing of Grosseto AFB, 36th Wing of Gioia del Colle AFB and 37th Wing of Trapani AFB arrived in Graf Ignatievo Air Base, Bulgaria, at the beginning of July and received the certification to operate in Bulgaria on July 14 (More details here). The two Air Forces will train together for the entire "TFA 4° Stormo" deployment that will end on October 15. The enhached Air Policing mission aims to safeguard allied airspace. NATO's Air Policing Mission ensures equal protection for all its member countries. Air defense co-operation also allows the aggregation and sharing of existing air assets by reducing the costs for defense operations thanks to the capabilities already owned by the allied countries. The four Italian Eurofighters participating in enhanced Air Policing in Bulgaria increase the capabilities of the Bulgarian Air Force in the protection of allied airspace.